Space-based solar power (SBSP) is the concept of collecting solar power in outer space and distributing it to Earth. Potential advantages of collecting solar energy in space include a higher collection rate and a longer collection period due to the lack of a diffusing atmosphere, and the possibility of placing a solar collector in an orbiting location where there is no night. A considerable fraction of incoming solar energy (55–60%) is lost on its way through the Earth's atmosphere by the effects of reflection and absorption. Space-based solar power systems convert sunlight to microwaves outside the atmosphere, avoiding these losses and the downtime due to the Earth's rotation, but at great cost due to the expense of launching material into orbit. SBSP is considered a form of sustainable or green energy, renewable energy, and is occasionally considered among climate engineering proposals. It is attractive to those seeking large-scale solutions to anthropogenic climate change or fossil fuel depletion (such as peak oil). Various SBSP proposals have been researched since the early 1970s, but none are economically viable with present-day space launch infrastructure. A modest Gigawatt-range microwave system, comparable to a large commercial power plant, would require launching some 80,000 tons of material to orbit, making the cost of energy from such a system vastly more expensive than even present-day renewable energy. Some technologists speculate that this may change in the distant future if an off-world industrial base were to be developed that could manufacture solar power satellites out of asteroids or lunar material, or if radical new space launch technologies other than rocketry should become available in the future. Besides the cost of implementing such a system, SBSP also introduces several technological hurdles, including the problem of transmitting energy from orbit to Earth's surface for use. Since wires extending from Earth's surface to an orbiting satellite are neither practical nor feasible with current technology, SBSP designs generally include the use of some manner of wireless power transmission with its concomitant conversion inefficiencies, as well as land use concerns for the necessary antenna stations to receive the energy at Earth's surface. The collecting satellite would convert solar energy into electrical energy on board, powering a microwave transmitter or laser emitter, and transmit this energy to a collector (or microwave rectenna) on Earth's surface. Contrary to appearances of SBSP in popular novels and video games, most designs propose beam energy densities that are not harmful if human beings were to be inadvertently exposed, such as if a transmitting satellite's beam were to wander off-course. But the vast size of the receiving antennas that would be necessary would still require large blocks of land near the end users to be procured and dedicated to this purpose. The service life of space-based collectors in the face of challenges from long-term exposure to the space environment, including degradation from radiation and micrometeoroid damage, could also become a concern for SBSP. SBSP is being actively pursued by Japan, China, and Russia. In 2008 Japan passed its Basic Space Law which established Space Solar Power as a national goal and JAXA has a roadmap to commercial SBSP. In 2015 the China Academy for Space Technology (CAST) showcased their roadmap at the International Space Development Conference. In 1941, science fiction writer Isaac Asimov published the science fiction short story "Reason", in which a space station transmits energy collected from the Sun to various planets using microwave beams. 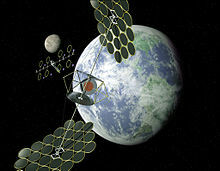 The SBSP concept, originally known as satellite solar-power system (SSPS), was first described in November 1968. In 1973 Peter Glaser was granted U.S. patent number 3,781,647 for his method of transmitting power over long distances (e.g. from an SPS to Earth's surface) using microwaves from a very large antenna (up to one square kilometer) on the satellite to a much larger one, now known as a rectenna, on the ground. Glaser then was a vice president at Arthur D. Little, Inc. NASA signed a contract with ADL to lead four other companies in a broader study in 1974. They found that, while the concept had several major problems – chiefly the expense of putting the required materials in orbit and the lack of experience on projects of this scale in space – it showed enough promise to merit further investigation and research. The project was not continued with the change in administrations after the 1980 US Federal elections. The Office of Technology Assessment concluded that "Too little is currently known about the technical, economic, and environmental aspects of SPS to make a sound decision whether to proceed with its development and deployment. In addition, without further research an SPS demonstration or systems-engineering verification program would be a high-risk venture." In 1997 NASA conducted its "Fresh Look" study to examine the modern state of SBSP feasibility. In assessing "What has changed" since the DOE study, NASA asserted that the "US National Space Policy now calls for NASA to make significant investments in technology (not a particular vehicle) to drive the costs of ETO [Earth to Orbit] transportation down dramatically. This is, of course, an absolute requirement of space solar power." Conversely, Dr. Pete Worden of NASA claimed that space-based solar is about five orders of magnitude more expensive than solar power from the Arizona desert, with a major cost being the transportation of materials to orbit. Dr. Worden referred to possible solutions as speculative, and which would not be available for decades at the earliest. On Nov 2, 2012, China proposed space collaboration with India that mentioned SBSP, " . . . may be Space-based Solar Power initiative so that both India and China can work for long term association with proper funding along with other willing space faring nations to bring space solar power to earth." In Feb. 2019 China (CAST) announced long term plans to build power satellites. Perform design studies of selected flight demonstration concepts. Evaluate studies of the general feasibility, design, and requirements. Create conceptual designs of subsystems that make use of advanced SSP technologies to benefit future space or terrestrial applications. Formulate a preliminary plan of action for the U.S. (working with international partners) to undertake an aggressive technology initiative. Construct technology development and demonstration roadmaps for critical Space Solar Power (SSP) elements. The increasing global energy demand is likely to continue for many decades resulting in new power plants of all sizes being built. The environmental impact of those plants and their impact on world energy supplies and geopolitical relationships can be problematic. Renewable energy is a compelling approach, both philosophically and in engineering terms. Many renewable energy sources are limited in their ability to affordably provide the base load power required for global industrial development and prosperity, because of inherent land and water requirements. Based on their Concept Definition Study, space solar power concepts may be ready to reenter the discussion. Solar power satellites should no longer be envisioned as requiring unimaginably large initial investments in fixed infrastructure before the emplacement of productive power plants can begin. Space solar power systems appear to possess many significant environmental advantages when compared to alternative approaches. The economic viability of space solar power systems depends on many factors and the successful development of various new technologies (not least of which is the availability of much lower cost access to space than has been available); however, the same can be said of many other advanced power technologies options. Space solar power may well emerge as a serious candidate among the options for meeting the energy demands of the 21st century. Space Solar Power Satellite Technology Development at the Glenn Research Center—An Overview. James E. Dudenhoefer and Patrick J. George, NASA Glenn Research Center, Cleveland, Ohio. Launch costs in the range of $100–$200 per kilogram of payload from low Earth orbit to Geosynchronous orbit are needed if SPS is to be economically viable. The May 2014 IEEE Spectrum magazine carried a lengthy article "It's Always Sunny in Space" by Dr. Susumu Sasaki. The article stated, "It's been the subject of many previous studies and the stuff of sci-fi for decades, but space-based solar power could at last become a reality—and within 25 years, according to a proposal from researchers at the Tokyo-based Japan Aerospace Exploration Agency (JAXA)." JAXA announced on 12 March 2015 that they wirelessly beamed 1.8 kilowatts 50 meters to a small receiver by converting electricity to microwaves and then back to electricity. This is the standard plan for this type of power. On 12 March 2015 Mitsubishi Heavy Industries demonstrated transmission of 10 kilowatts (kW) of power to a receiver unit located at a distance of 500 meters (m) away. It is always solar noon in space and full sun. Collecting surfaces could receive much more intense sunlight, owing to the lack of obstructions such as atmospheric gasses, clouds, dust and other weather events. Consequently, the intensity in orbit is approximately 144% of the maximum attainable intensity on Earth's surface. A satellite could be illuminated over 99% of the time, and be in Earth's shadow a maximum of only 72 minutes per night at the spring and fall equinoxes at local midnight. Orbiting satellites can be exposed to a consistently high degree of solar radiation, generally for 24 hours per day, whereas earth surface solar panels currently collect power for an average of 29% of the day. Power could be relatively quickly redirected directly to areas that need it most. A collecting satellite could possibly direct power on demand to different surface locations based on geographical baseload or peak load power needs. Typical contracts would be for baseload, continuous power, since peaking power is ephemeral. Elimination of plant and wildlife interference. With very large scale implementations, especially at lower altitudes, it potentially can reduce incoming solar radiation reaching earth's surface. This would be desirable for counteracting the effects of global warming. Inaccessibility: Maintenance of an earth-based solar panel is relatively simple, but construction and maintenance on a solar panel in space would typically be done telerobotically. In addition to cost, astronauts working in GEO (geosynchronous Earth orbit) are exposed to unacceptably high radiation dangers and risk and cost about one thousand times more than the same task done telerobotically. The space environment is hostile; panels suffer about 8 times the degradation they would on Earth (except at orbits that are protected by the magnetosphere). The large size and corresponding cost of the receiving station on the ground. Energy losses during several phases of conversion from photons to electrons to photons back to electrons. Artist's concept of a solar disk on top of a LEO to GEO electrically powered space tug. The space-based portion will not need to support itself against gravity (other than relatively weak tidal stresses). It needs no protection from terrestrial wind or weather, but will have to cope with space hazards such as micrometeors and solar flares. Two basic methods of conversion have been studied: photovoltaic (PV) and solar dynamic (SD). Most analyses of SBSP have focused on photovoltaic conversion using solar cells that directly convert sunlight into electricity. Solar dynamic uses mirrors to concentrate light on a boiler. The use of solar dynamic could reduce mass per watt. Wireless power transmission was proposed early on as a means to transfer energy from collection to the Earth's surface, using either microwave or laser radiation at a variety of frequencies. William C. Brown demonstrated in 1964, during Walter Cronkite's CBS News program, a microwave-powered model helicopter that received all the power it needed for flight from a microwave beam. Between 1969 and 1975, Bill Brown was technical director of a JPL Raytheon program that beamed 30 kW of power over a distance of 1 mile (1.6 km) at 84% efficiency. Microwave power transmission of tens of kilowatts has been well proven by existing tests at Goldstone in California (1975) and Grand Bassin on Reunion Island (1997). Laser power beaming was envisioned by some at NASA as a stepping stone to further industrialization of space. In the 1980s, researchers at NASA worked on the potential use of lasers for space-to-space power beaming, focusing primarily on the development of a solar-powered laser. In 1989 it was suggested that power could also be usefully beamed by laser from Earth to space. In 1991 the SELENE project (SpacE Laser ENErgy) had begun, which included the study of laser power beaming for supplying power to a lunar base. The SELENE program was a two-year research effort, but the cost of taking the concept to operational status was too high, and the official project ended in 1993 before reaching a space-based demonstration. In 1988 the use of an Earth-based laser to power an electric thruster for space propulsion was proposed by Grant Logan, with technical details worked out in 1989. He proposed using diamond solar cells operating at 600 degrees[clarification needed] to convert ultraviolet laser light. The main advantage of locating a space power station in geostationary orbit is that the antenna geometry stays constant, and so keeping the antennas lined up is simpler. Another advantage is that nearly continuous power transmission is immediately available as soon as the first space power station is placed in orbit; other space-based power stations have much longer start-up times before they are producing nearly continuous power. A collection of LEO (Low Earth Orbit) space power stations has been proposed as a precursor to GEO (Geostationary Orbit) space-based solar power. The Earth-based rectenna would likely consist of many short dipole antennas connected via diodes. Microwave broadcasts from the satellite would be received in the dipoles with about 85% efficiency. With a conventional microwave antenna, the reception efficiency is better, but its cost and complexity are also considerably greater. Rectennas would likely be several kilometers across. A laser SBSP could also power a base or vehicles on the surface of the Moon or Mars, saving on mass costs to land the power source. A spacecraft or another satellite could also be powered by the same means. In a 2012 report presented to NASA on Space Solar Power, the author mentions another potential use for the technology behind Space Solar Power could be for Solar Electric Propulsion Systems that could be used for interplanetary human exploration missions. One problem for the SBSP concept is the cost of space launches and the amount of material that would need to be launched. Gerard O'Neill, noting the problem of high launch costs in the early 1970s, proposed building the SPS's in orbit with materials from the Moon. Launch costs from the Moon are potentially much lower than from Earth, due to the lower gravity and lack of atmospheric drag. This 1970s proposal assumed the then-advertised future launch costing of NASA's space shuttle. This approach would require substantial up front capital investment to establish mass drivers on the Moon. Nevertheless, on 30 April 1979, the Final Report ("Lunar Resources Utilization for Space Construction") by General Dynamics' Convair Division, under NASA contract NAS9-15560, concluded that use of lunar resources would be cheaper than Earth-based materials for a system of as few as thirty Solar Power Satellites of 10GW capacity each. In 1980, when it became obvious NASA's launch cost estimates for the space shuttle were grossly optimistic, O'Neill et al. published another route to manufacturing using lunar materials with much lower startup costs. This 1980s SPS concept relied less on human presence in space and more on partially self-replicating systems on the lunar surface under remote control of workers stationed on Earth. The high net energy gain of this proposal derives from the Moon's much shallower gravitational well. Having a relatively cheap per pound source of raw materials from space would lessen the concern for low mass designs and result in a different sort of SPS being built. The low cost per pound of lunar materials in O'Neill's vision would be supported by using lunar material to manufacture more facilities in orbit than just solar power satellites. Advanced techniques for launching from the Moon may reduce the cost of building a solar power satellite from lunar materials. Some proposed techniques include the lunar mass driver and the lunar space elevator, first described by Jerome Pearson. It would require establishing silicon mining and solar cell manufacturing facilities on the Moon. Physicist Dr David Criswell suggests the Moon is the optimum location for solar power stations, and promotes lunar-based solar power. The main advantage he envisions is construction largely from locally available lunar materials, using in-situ resource utilization, with a teleoperated mobile factory and crane to assemble the microwave reflectors, and rovers to assemble and pave solar cells, which would significantly reduce launch costs compared to SBSP designs. Power relay satellites orbiting around earth and the Moon reflecting the microwave beam are also part of the project. A demo project of 1 GW starts at $50 billion. The Shimizu Corporation use combination of lasers and microwave for the Luna Ring concept, along with power relay satellites. 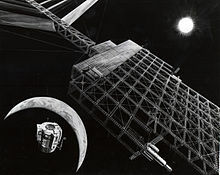 An artist's conception of a "self-growing" robotic lunar factory. Microwave reflectors on the moon and teleoperated robotic paving rover and crane. Sketch of the Lunar Crawler to be used for fabrication of lunar solar cells on the surface of the Moon. Shown here is an array of solar collectors that convert power into microwave beams directed toward Earth. A solar power satellite built from a mined asteroid. The use of microwave transmission of power has been the most controversial issue in considering any SPS design. At the Earth's surface, a suggested microwave beam would have a maximum intensity at its center, of 23 mW/cm2 (less than 1/4 the solar irradiation constant), and an intensity of less than 1 mW/cm2 outside the rectenna fenceline (the receiver's perimeter). These compare with current United States Occupational Safety and Health Act (OSHA) workplace exposure limits for microwaves, which are 10 mW/cm2,[original research?] - the limit itself being expressed in voluntary terms and ruled unenforceable for Federal OSHA enforcement purposes. A beam of this intensity is therefore at its center, of a similar magnitude to current safe workplace levels, even for long term or indefinite exposure. [original research?] Outside the receiver, it is far less than the OSHA long-term levels Over 95% of the beam energy will fall on the rectenna. The remaining microwave energy will be absorbed and dispersed well within standards currently imposed upon microwave emissions around the world. It is important for system efficiency that as much of the microwave radiation as possible be focused on the rectenna. Outside the rectenna, microwave intensities rapidly decrease, so nearby towns or other human activity should be completely unaffected. Exposure to the beam is able to be minimized in other ways. On the ground, physical access is controllable (e.g., via fencing), and typical aircraft flying through the beam provide passengers with a protective metal shell (i.e., a Faraday Cage), which will intercept the microwaves. Other aircraft (balloons, ultralight, etc.) can avoid exposure by observing airflight control spaces, as is currently done for military and other controlled airspace. The microwave beam intensity at ground level in the center of the beam would be designed and physically built into the system; simply, the transmitter would be too far away and too small to be able to increase the intensity to unsafe levels, even in principle. In addition, a design constraint is that the microwave beam must not be so intense as to injure wildlife, particularly birds. Experiments with deliberate microwave irradiation at reasonable levels have failed to show negative effects even over multiple generations. Suggestions have been made to locate rectennas offshore, but this presents serious problems, including corrosion, mechanical stresses, and biological contamination. A commonly proposed approach to ensuring fail-safe beam targeting is to use a retrodirective phased array antenna/rectenna. 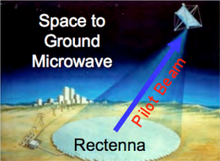 A "pilot" microwave beam emitted from the center of the rectenna on the ground establishes a phase front at the transmitting antenna. There, circuits in each of the antenna's subarrays compare the pilot beam's phase front with an internal clock phase to control the phase of the outgoing signal. This forces the transmitted beam to be centered precisely on the rectenna and to have a high degree of phase uniformity; if the pilot beam is lost for any reason (if the transmitting antenna is turned away from the rectenna, for example) the phase control value fails and the microwave power beam is automatically defocused. Such a system would be physically incapable of focusing its power beam anywhere that did not have a pilot beam transmitter. The long-term effects of beaming power through the ionosphere in the form of microwaves has yet to be studied, but nothing has been suggested which might lead to any significant effect. 1941: Isaac Asimov published the science fiction short story "Reason," in which a space station transmits energy collected from the sun to various planets using microwave beams. 1968: Dr. Peter Glaser introduces the concept of a "solar power satellite" system with square miles of solar collectors in high geosynchronous orbit for collection and conversion of sun's energy into a microwave beam to transmit usable energy to large receiving antennas (rectennas) on Earth for distribution. 1973: Dr. Peter Glaser is granted United States patent number 3,781,647 for his method of transmitting power over long distances using microwaves from a large (one square kilometer) antenna on the satellite to a much larger one on the ground, now known as a rectenna. 1978–81: The United States Department of Energy and NASA examine the solar power satellite (SPS) concept extensively, publishing design and feasibility studies. 1995–97: NASA conducts a "Fresh Look" study of space solar power (SSP) concepts and technologies. 1998: The Space Solar Power Concept Definition Study (CDS) identifies credible, commercially viable SSP concepts, while pointing out technical and programmatic risks. 1998: Japan's space agency begins developing a Space Solar Power System (SSPS), a program that continues to the present day. 1999: NASA's Space Solar Power Exploratory Research and Technology program (SERT, see below) begins. 2000: John Mankins of NASA testifies in the U.S. House of Representatives, saying "Large-scale SSP is a very complex integrated system of systems that requires numerous significant advances in current technology and capabilities. A technology roadmap has been developed that lays out potential paths for achieving all needed advances — albeit over several decades. 2001: NASDA (One of Japan's national space agencies before it became part of JAXA) announces plans to perform additional research and prototyping by launching an experimental satellite with 10 kilowatts and 1 megawatt of power. 2007: The US Pentagon's National Security Space Office (NSSO) issues a report on October 10, 2007 stating they intend to collect solar energy from space for use on Earth to help the United States' ongoing relationship with the Middle East and the battle for oil. A demo plant could cost $10 billion, produce 10 megawatts, and become operational in 10 years. 2007: In May 2007 a workshop is held at the US Massachusetts Institute of Technology (MIT) to review the current state of the SBSP market and technology. 2010: Professors Andrea Massa and Giorgio Franceschetti announce a special session on the "Analysis of Electromagnetic Wireless Systems for Solar Power Transmission" at the 2010 Institute of Electrical and Electronics Engineers International Symposium on Antennas and Propagation. 2010: The Indian Space Research Organisation and US' National Space Society launched a joint forum to enhance partnership in harnessing solar energy through space-based solar collectors. Called the Kalam-NSS Initiative after the former Indian President Dr APJ Abdul Kalam, the forum will lay the groundwork for the space-based solar power program which could see other countries joining in as well. 2010: Sky's No Limit: Space-Based solar power, the next major step in the Indo-US strategic partnership?] written by USAF Lt Col Peter Garretson was published at the Institute for Defence Studies and Analysis. 2012: China proposed joint development between India and China towards developing a solar power satellite, during a visit by former Indian President Dr APJ Abdul Kalam. 2015: The Space Solar Power Initiative (SSPI) is established between Caltech and Northrop Grumman Corporation. An estimated $17.5 million is to be provided over a three year project for development of a space-based solar power system. 2015: JAXA announced on 12 March 2015 that they wirelessly beamed 1.8 kilowatts 50 meters to a small receiver by converting electricity to microwaves and then back to electricity. 2016: Lt Gen. Zhang Yulin, deputy chief of the [PLA] armament development department of the Central Military Commission, suggested that China would next begin to exploit Earth-Moon space for industrial development. The goal would be the construction of space-based solar power satellites that would beam energy back to Earth. 2016: Citizens for Space-Based Solar Power has transformed the D3 proposal into active petitions on the White House Website "America Must Lead the Transition to Space-Based Energy"and Change.org "USA Must Lead the Transition to Space-Based Energy" along with the following video. 2016: Erik Larson and others from NOAA produce a paper "Global atmospheric response to emissions from a proposed reusable space launch system" The paper makes a case that up to 2 TW/year of power satellites could be constructed without intolerable damage to the atmosphere. Before this paper there was concern that the NOx produced by reentry would destroy too much ozone. 2017: NASA selects five new research proposals focused on investments in space. The Colorado School of Mines focuses on "21st Century Trends in Space-Based Solar Power Generation and Storage." Sun Earth L1: Robert Kennedy III, Ken Roy & David Fields have proposed a variant of the L1 sunshade called "Dyson Dots" where a multi-terawatt primary collector would beam energy back to a series of LEO sun-synchronous receiver satellites. The much farther distance to Earth requires a correspondingly larger transmission aperture. Lunar Surface: Dr. David Criswell has proposed using the Lunar surface itself as the collection medium, beaming power to the ground via a series of microwave reflectors in Earth Orbit. The chief advantage of this approach would be the ability to manufacture the solar collectors in-situ without the energy cost and complexity of launch. Disadvantages include the much longer distance, requiring larger transmission systems, the required "overbuild" to deal with the lunar night, and the difficulty of sufficient manufacturing and pointing of reflector satellites. MEO: MEO systems have been proposed for in-space utilities and beam-power propulsion infrastructures. For example, see Royce Jones' paper. Highly Elliptical Orbits: Molniya, Tundra, or Quazi Zenith orbits have been proposed as early locations for niche markets, requiring less energy to access and providing good persistence. Sun-Sync LEO: In this near Polar Orbit, the satellites precess at a rate that allows them to always face the Sun as they rotate around Earth. This is an easy to access orbit requiring far less energy, and its proximity to Earth requires smaller (and therefore less massive) transmitting apertures. However disadvantages to this approach include having to constantly shift receiving stations, or storing energy for a burst transmission. This orbit is already crowded and has significant space debris. Equatorial LEO: Japan's SPS 2000 proposed an early demonstrator in equatorial LEO in which multiple equatorial participating nations could receive some power. Earth's Surface: Dr. Narayan Komerath has proposed a space power grid where excess energy from an existing grid or power plant on one side of the planet can be passed up to orbit, across to another satellite and down to receivers. Energy Collection: The most typical designs for Solar Power Satellites include photovoltaics. These may be planar (and usually passively cooled), concentrated (and perhaps actively cooled). However, there are multiple interesting variants. Solar Pumped Laser: Japan has pursued a solar-pumped laser, where sunlight directly excites the lasing medium used to create the coherent beam to Earth. Fusion Decay: This version of a power-satellite is not "solar". Rather, the vacuum of space is seen as a "feature not a bug" for traditional fusion. Per Dr. Paul Werbos, after fusion even neutral particles decay to charged particles which in a sufficiently large volume would allow direct conversion to current. Solar Wind Loop: Also called a Dyson–Harrop satellite. Here the satellite makes use not of the photons from the Sun but rather the charged particles in the solar wind which via electro-magnetic coupling generate a current in a large loop. Direct Mirrors: Early concepts for direct mirror re-direction of light to planet Earth suffered from the problem that rays coming from the sun are not parallel but are expanding from a disk and so the size of the spot on the Earth is quite large. Dr. Lewis Fraas has explored an array of parabolic mirrors to augment existing solar arrays. Swarms of Smaller Satellites: Some designs propose swarms of free-flying smaller satellites. This is the case with several laser designs, and appears to be the case with CALTECH's Flying Carpets. For RF designs, an engineering constraint is the sparse array problem. Free Floating Components: Solaren has proposed an alternative to the monolithic structure where the primary reflector and transmission reflector are free-flying. Spin Stabilization: NASA explored a spin-stabilized thin film concept. Photonic Laser Thruster (PLT) stabilized structure: Dr. Young Bae has proposed that photon pressure may substitute for compressive members in large structures. Laser: Lasers offer the advantage of much lower cost and mass to first power, however there is controversy regarding benefits of efficiency. Lasers allow for much smaller transmitting and receiving apertures. However, a highly concentrated beam has eye-safety, fire safety, and weaponization concerns. Proponents believe they have answers to all these concerns. A laser-based approach must also find alternate ways of coping with precipitation. Atmospheric Waveguide: Some have proposed it may be possible to use a short pulse laser to create an atmospheric waveguide through which concentrated microwaves could flow. Nuclear synthesis: Particle accelerators based in the inner solar system (whether in orbit or on a planet such as Mercury) could use solar energy to synthesize nuclear fuel from naturally-occurring materials. While this would be highly inefficient using current technology (in terms of the amount of energy needed to manufacture the fuel compared to the amount of energy contained in the fuel) and would raise obvious nuclear safety issues, the basic technology upon which such an approach would rely on has been in use for decades, making this possibly the most reliable means of sending energy especially over very long distances - in particular, from the inner solar system to the outer solar system. Lunar Materials: Designs exist for Solar Power Satellites that source >99% of materials from lunar regolith with very small inputs of "vitamins" from other locations. Using materials from the Moon is attractive because launch from the Moon is in theory far less complicated than from Earth. There is no atmosphere, and so components do not need to be packed tightly in an aeroshell and survive vibration, pressure and temperature loads. Launch may be via a magnetic mass driver and the requirement to use propellant for launch entirely. Launch from the Moon the GEO also requires far less energy than from Earth's much deeper gravity well. Building all the solar power satellites to fully supply all the required energy for the entire planet requires less than one millionth of the mass of the Moon. Self-Replication on the Moon: NASA explored a self-replicating factory on the Moon in 1980. More recently, Justin Lewis-Webber proposed a method of speciated manufacture of core elements based upon John Mankins SPS-Alpha design. Asteroidal Materials: Some asteroids are thought to have even lower Delta-V to recover materials than the Moon, and some particular materials of interest such as metals may be more concentrated or easier to access. In-Space/In-Situ Manufacturing: With the advent of in-space additive manufacturing, concepts such as SpiderFab might allow mass launch of raw materials for local extrusion. Lunar Chemical Launch: ULA has recently showcased a concept for a fully re-usable chemical lander XEUS to move materials from the Lunar surface to LLO or GEO. Lunar Mass Driver: Launch of materials from the lunar surface using a system similar to an aircraft carrier electromagnetic catapult. An unexplored compact alternative would be the slingatron. Lunar Space Elevator: An equatorial or near-equatorial cable extends to and through the lagrange point. This is claimed by proponents to be lower in mass than a traditional mass driver. Space Elevator: A ribbon of pure carbon nanotubes extends from its center of gravity in Geostationary orbit, allowing climbers to climb up to GEO. Problems with this include the material challenge of creating a ribbon of such length with adequate strength, management of collisions with satellites and space debris, and lightning. MEO Skyhook: As part of an AFRL study, Roger Lenard proposed a MEO Skyhook. It appears that a gravity gradient-stabilized tether with its center of mass in MEO can be constructed of available materials. The bottom of the skyhook is close to the atmosphere in a "non-keplerian orbit". A re-usable rocket can launch to match altitude and speed with the bottom of the tether which is in a non-keplerian orbit (travelling much slower than typical orbital speed). The payload is transferred and it climbs the cable. The cable itself is kept from de-orbiting via electric propulsion and/or electromagnetic effects. MAGLEV Launch / StarTram: John Powell has a concept for a very high mass-flow system. In a first-gen system, built into a mountain, accelerates a payload through an evacuated MAGLEV track. A small on-board rocket circulizes the payload. Beamed Energy Launch: Kevin Parkin and Escape Dynamics both have concepts for ground-based irradiation of a mono-propellant launch vehicle using RF energy. The RF energy is absorbed and directly heats the propellant not unlike in NERVA-style nuclear-thermal. LaserMotive has a concept for a laser-based approach. Space stations transmitting solar power have appeared in science-fiction works like Isaac Asimov's "Reason" (1941), that centers around the troubles caused by the robots operating the station. Asimov's short story "The Last Question" also features the use of SBSP to provide limitless energy for use on Earth. In Ben Bova's novel PowerSat (2005), an entrepreneur strives to prove that his company's nearly completed power satellite and spaceplane (a means of getting maintenance crews to the satellite efficiently) are both safe and economically viable, while terrorists with ties to oil producing nations attempt to derail these attempts through subterfuge and sabotage. Various aerospace companies have also showcased imaginative future solar power satellites in their corporate vision videos, including Boeing, Lockheed Martin, and United Launch Alliance. The Solar Satellite is one of three means of producing energy in the browser-based game OGame. Wikimedia Commons has media related to Space-based solar power. The National Space Society maintains an extensive Space Solar Power Library of all major historical documents and studies associated with space solar power, and major news articles. ^ "Space-based solar power". ESA–advanced concepts team. Retrieved August 23, 2015. ^ a b "Space-Based Solar Power". United States Department of Energy (DOE). 6 March 2014. ^ "Basic Plan for Space Policy" (PDF). June 2, 2009. Retrieved May 21, 2016. ^ Glaser, P. E. (1968). "Power from the Sun: Its Future". Science. 162 (3856): 857–61. Bibcode:1968Sci...162..857G. doi:10.1126/science.162.3856.857. PMID 17769070. ^ a b Glaser, Peter E. (December 25, 1973). "Method And Apparatus For Converting Solar Radiation To Electrical Power". United States Patent 3,781,647. ^ "Satellite Power System Concept Development and Evaluation Program Reference System Report. DOE/ER-0023, October 1978. 322" (PDF). ^ "Satellite Power System (SPS) Resource Requirements (Critical Materials, Energy, and Land). HCP/R-4024-02, October 1978" (PDF). ^ Satellite Power System (SPS) Financial/Management Scenarios. Prepared by Herbert E. Kierulff. HCP/R-4024-13, October 1978. 66 pages. ^ Satellite Power System (SPS) Public Acceptance. HCP/R-4024-04, October 1978. 85 pages. ^ Satellite Power System (SPS) State and Local Regulations as Applied to Satellite Power System Microwave Receiving Antenna Facilities. HCP/R-4024-05, October 1978. 92 pages. ^ Satellite Power System (SPS) Student Participation. HCP/R-4024-06, October 1978. 97 pages. ^ Potential of Laser for SPS Power Transmission. HCP/R-4024-07, October 1978. 112 pages. ^ Satellite Power System (SPS) International Agreements. Prepared by Carl Q. Christol. HCP-R-4024-08, October 1978. 283 pages. ^ Satellite Power System (SPS) International Agreements. Prepared by Stephen Grove. HCP/R-4024-12, October 1978. 86 pages. ^ Satellite Power System (SPS) Centralization/Decentralization. HCP/R-4024-09, October 1978. 67 pages. ^ "Satellite Power System (SPS) Mapping of Exclusion Areas For Rectenna Sites. HCP-R-4024-10, October 1978. 117 pages" (PDF). ^ Economic and Demographic Issues Related to Deployment of the Satellite Power System (SPS). ANL/EES-TM-23, October 1978. 71 pages. ^ Some Questions and Answers About the Satellite Power System (SPS). DOE/ER-0049/1, January 1980. 47 pages. ^ Satellite Power Systems (SPS) Laser Studies: Meteorological Effects on Laser Beam Propagation and Direct Solar Pumped Lasers for the SPS. NASA Contractor Report 3347, November 1980. 143 pages. ^ Satellite Power System (SPS) Public Outreach Experiment. DOE/ER-10041-T11, December 1980. 67 pages. ^ http://www.nss.org/settlement/ssp/library/1981NASASPS-PowerTransmissionAndReception.pdf "Satellite Power System Concept Development and Evaluation Program: Power Transmission and Reception Technical Summary and Assessment" NASA Reference Publication 1076, July 1981. 281 pages. ^ "Satellite Power System Concept Development and Evaluation Program: Space Transportation. NASA Technical Memorandum 58238, November 1981. 260 pages" (PDF). ^ Solar Power Satellites. Office of Technology Assessment, August 1981. 297 pages. ^ A Fresh Look at Space Solar Power: New Architectures, Concepts, and Technologies. John C. Mankins. International Astronautical Federation IAF-97-R.2.03. 12 pages. ^ "Dr. Pete Worden on thespaceshow". thespaceshow.com. 23 March 2009. Archived from the original on 7 July 2012. ^ "China proposes space collaboration with India - The Times of India". The Times Of India. ^ "Plans for first Chinese solar power station in space revealed". The Sydney Morning Herald. ^ "How Japan Plans to Build an Orbital Solar Farm". ^ a b Tarantola, Andrew (12 March 2015). "Scientists make strides in beaming solar power from space" (PDF). 162 (3856): 857–861. ^ a b "Japan space scientists make wireless energy breakthrough". ^ "MHI Successfully Completes Ground Demonstration Testing of Wireless Power Transmission Technology for SSPS". 12 March 2015. ^ Solar Power Satellites. Washington, D.C.: Congress of the U.S., Office of Technology Assessment. August 1981. p. 66. LCCN 81600129. ^ Collection at Earth's poles can take place for 24 hours per day, but there are very small loads demanded at the poles. ^ In space, panels suffer rapid erosion due to high energy particles,"Solar Panel Degradation" Archived 2011-09-29 at the Wayback Machine whereas on Earth, commercial panels degrade at a rate around 0.25% a year. "Testing a Thirty-Year-Old Photovoltaic Module"
^ "Some of the most environmentally dangerous activities in space include [...] large structures such as those considered in the late-1970s for building solar power stations in Earth orbit. "The Kessler Syndrome (As Discussed by Donald J. Kessler)". Retrieved 2010-05-26. ^ Kathryn Doyle, "Elon Musk on SpaceX, Tesla, and Why Space Solar Power Must Die", Popular Mechanics, 2012-10-04. Retrieved 2016-01-14. ^ a b Brown, W.C. (1984). "The History of Power Transmission by Radio Waves". IEEE Transactions on Microwave Theory and Techniques. 32 (9): 1230. Bibcode:1984ITMTT..32.1230B. doi:10.1109/TMTT.1984.1132833. ^ "Wireless Power Transmission 34kw over 1 mile at 82.5% efficiency Goldstone 1975". 13 March 2008 – via YouTube. ^ POINT-TO-POINT WIRELESS POWER TRANSPORTATION IN REUNION ISLAND Archived 2005-10-23 at the Wayback Machine 48th International Astronautical Congress, Turin, Italy, 6–10 October 1997 – IAF-97-R.4.08 J. D. Lan Sun Luk, A. Celeste, P. Romanacce, L. Chane Kuang Sang, J. C. Gatina – University of La Réunion – Faculty of Science and Technology. ^ POINT-TO-POINT WIRELESS POWER TRANSPORTATION IN HAWAII. ^ Sasaki, Susumu; Tanaka, Koji; Maki, Ken-Ichiro (2013). "Microwave Power Transmission Technologies for Solar Power Satellites". Proceedings of the IEEE. 101 (6): 1438. doi:10.1109/JPROC.2013.2246851. ^ Massa, Andrea; Oliveri, Giacomo; Viani, Federico; Rocca, Paolo (2013). "Array Designs for Long-Distance Wireless Power Transmission: State-of-the-Art and Innovative Solutions". Proceedings of the IEEE. 101 (6): 1464. doi:10.1109/JPROC.2013.2245491. ^ Komerath, N.M; Boechler, N. (October 2006). The Space Power Grid. Valencia, Spain: 57th International Astronautical Federation Congress. IAC-C3.4.06. ^ Mankins, John. "SPS-ALPHA: The First Practical Solar Power Satellite via Arbitrarily Large Phased Array" (PDF). Retrieved 24 April 2014. ^ "Second Beamed Space-Power Workshop" (PDF). Nasa. 1989. pp. near page 290. ^ Henry W. Brandhorst, Jr. (October 27, 2010). "Options for Lunar Power Beaming" (PDF). Brandhorst. FISO group. ^ "Space-Based Solar Power". energy.gov. ^ "Case For Space Based Solar Power Development". August 2003. Retrieved 2006-03-14. ^ "2006_program_update" (PDF). Archived from the original (PDF) on 2007-01-10. ^ "Colonizing Space - '70s Style!". 11 December 2009 – via YouTube. ^ General Dynamics Convair Division (1979). Lunar Resources Utilization for Space Construction (PDF). GDC-ASP79-001. ^ O'Neill, Gerard K.; Driggers, G.; O'Leary, B. (1980). "New Routes to Manufacturing in Space". Astronautics and Aeronautics. 18: 46–51. Bibcode:1980AsAer..18...46G. Several scenarios for the buildup of industry in space are described. One scenario involves a manufacturing facility, manned by a crew of three, entirely on the lunar surface. Another scenario involves a fully automated manufacturing facility, remotely supervised from the earth, with provision for occasional visits by repair crews. A third case involves a manned facility on the Moon for operating a mass-driver launcher to transport lunar materials to a collection point in space and for replicating mass-drivers. ^ Pearson, Jerome; Eugene Levin, John Oldson and Harry Wykes (2005). Lunar Space Elevators for Cislunar Space Development Phase I Final Technical Report (PDF). ^ "UH Mobile - Space-Related Centers at UH Target Next 50 Years of Exploration". ^ "Criswell - Publications and Abstracts". Archived from the original on 2010-06-22. ^ David Warmflash (29 March 2017). "Beaming solar energy from the Moon could solve Earth's energy crisis". Wired.co.uk. Condé Nast. Retrieved February 27, 2018. ^ "The Luna Ring concept". ^ "Lunar Solar Power Generation, "The LUNA RING", Concept and Technology" (PDF). Japan-U.S. Science, Technology & Space Applications Program. 2009. Archived from the original (PDF) on 2013-12-08. ^ Space Resources, NASA SP-509, Vol 1. ^ "Retrieval of Asteroidal Materials". ^ Stephen D. Covey (May 2011). "Technologies for Asteroid Capture into Earth Orbit". ^ Hanley., G.M.. . "Satellite Concept Power Systems (SPS) Definition Study" (PDF). NASA CR 3317, Sept 1980. ^ Radiofrequency and Microwave Radiation Standards interpretation of General Industry (29 CFR 1910) 1910 Subpart G, Occupational Health and Environmental Control 1910.97, Non-ionizing radiation. ^ Freeman, J. W.; . ; et al. (1980). "Offshore rectenna feasibility". In NASA, Washington the Final Proc. of the Solar Power Satellite Program Rev. p 348-351 (SEE N82-22676 13-44). Bibcode:1980spsp.nasa..348F. ^ "Controversy Flares Over Space-Based Solar Power Plans". ^ "History of research on SPS". Archived from the original on 2012-10-22. ^ "Making the case, again, for space-based solar power". thespacereview.com. November 28, 2011. ^ "Sky's No Limit: Space-based solar power, the next major step in the Indo-US strategic partnership? | Institute for Defence Studies and Analyses". www.idsa.in. Retrieved 2016-05-21. ^ "Exploiting earth-moon space: China's ambition after space station - Xinhua | English.news.cn". news.xinhuanet.com. Retrieved 2016-05-21. ^ 宋薇. "Exploiting earth-moon space: China's ambition after space station - China - Chinadaily.com.cn". www.chinadaily.com.cn. Retrieved 2016-05-21. ^ Larson, Erik J. L.; Portmann, Robert W.; Rosenlof, Karen H.; Fahey, David W.; Daniel, John S.; Ross, Martin N. (2017). "Global atmospheric response to emissions from a proposed reusable space launch system". Earth's Future. 5 (1): 37–48. Bibcode:2017EaFut...5...37L. doi:10.1002/2016EF000399. ^ Kennedy, Robert G.; Roy, Kenneth I.; Fields, David E. (2013). "Dyson Dots: Changing the solar constant to a variable with photovoltaic lightsails". Acta Astronautica. 82 (2): 225–37. Bibcode:2013AcAau..82..225K. doi:10.1016/j.actaastro.2012.10.022. ^ "Events - "Long-lived Atmospheric Waveguide in the Wake of Laser Filaments"". phys.technion.ac.il. Retrieved 2016-05-23. ^ Lewis-Weber, Justin (2016). "Lunar-Based Self-Replicating Solar Factory". New Space. 4: 53–62. Bibcode:2016NewSp...4...53L. doi:10.1089/space.2015.0041. The World Needs Energy from Space Space-based solar technology is the key to the world's energy and environmental future, writes Peter E. Glaser, a pioneer of the technology. Japan's plans for a Solar Power Station in Space - the Japanese government hopes to assemble a space-based solar array by 2040. Space Energy, Inc. - Space Energy, Inc.
Whatever happened to solar power satellites? An article that covers the hurdles in the way of deploying a solar power satellite. Solar Power Satellite from Lunar and Asteroidal Materials Provides an overview of the technological and political developments needed to construct and utilize a multi-gigawatt power satellite. Also provides some perspective on the cost savings achieved by using extraterrestrial materials in the construction of the satellite. A renaissance for space solar power? by Jeff Foust, Monday, August 13, 2007 Reports on renewed institutional interest in SSP, and a lack of such interest in past decades. A simulation of AM reception from an aerial powering two inductive loads and recharging a battery.